Northern Michigan Canoeing & Kayaking at its Finest! 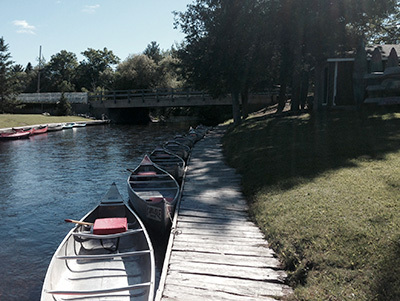 The AuSable River is one Michigan's top rated rivers for canoeing and kayaking. Impressively, the AuSable River is also recognized for being one the best fishing rivers for brown trout in the world. This fact caused the state to take action back in the late 80's. The AuSable Natural River Plan was implemented in an effort to preserve this beautiful river and allow folks to experience the same beauty as those that paddled it years ago. The plan included rules and regulations including housing setbacks, dock sizes, and no clearing of woods up to the river... all in an effort to keep the river natural and scenic for the canoeist, kayaker and fishing enthusiasts. The river's origin is about 20 miles north of Grayling were it meanders its way south until it takes a turn east toward Lake Huron ending 120 miles later. The crystal clear waters of the AuSable River has a rocky, sandy bottom and a current averaging 3 to 4 miles per hour. Averaging 2 to 4 foot deep, the AuSable River is perfect for beginners and experts alike looking to relax and take in all of what mother nature has to offer.